In about one month Queen Beatrix will sign the new law to illegalize squatting in NL. To prevent homelessness we should squat her little apartment at Dam Square in Amsterdam. The Palace is big enough, so if you face eviction, come squatting! 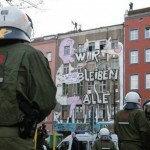 The ban of squatting (kraakverbod) is a consequence of long term lobbying by rich landlords and real estate agents. Their friends in parliament have a majority now, which makes the ban of squatting likely to happen. On December 1st, the first chamber of Dutch parliament will have to decide, if the proposed law is passed on to Beatrix, or if adjustments or required. We attack that day to start our resistance! 24th November 2009 Show your solidarity, galvanize and engage in DECENTRALIZED ACTIONS all over the city! Express your anger in various and creative ways! REPOST THIS MESSAGE, spread it over your mailing list, wake up your flat mates and call your friends ! The cops shouldn’t have any rest the next nights and days, keep them on the go! Organize demos / parties / riots!!! Solidarity IS a weapon! Let hell break loose in Berlin! Burn down your local german embassy!!! The ownwer of the house: Dr. Kronawitter,Prinz-Eugen-Straße 3 · 94034 Passau (Germany), phone:+49 851 49 349-0 , fax:49 851 49 349-49 Give him what he needs. In the dark chilly woods, a new wind is stirring; winter is moving in, and with the cold nights come a new band of pirates and elves tiptoeing their way between the trees. But all ends are new beginnings in disguise, and a new seed of mutiny has been sewn in the fertile soil of the forest.As long as it stands threatened, the Lappersfort will be okupied by humans to defend it. Torino city council, with the “leftist” Chiamparino at its head, has decided last november 16th to evict every squat in Torino. The anarchist squats are especially threatened: l’Asilo, the Barocchio, El Paso, Mezcal, Lostilo, la Boccia squat, etc. This a sort of declaration of war against the squat movement. The Torino’s anarchist and autonomous squats call to mobilization and resistance. The anarchist squat movement in Torino is an important reality for near than 30 years. Every solidarity action is welcome, send messages to squat at squat.net and to the websites Tutto Squat and Indymedia-Piemonte. You also can demonstrate in front of italian embassies and consulates, and other italian representations. 10.. 100.. 500.. 1 000.. 5 000.. 10 000 occupazioni ! We are squatters from the Netherlands. We are asking you to organize a protest (for example by dutch embassy) in your country against squatting prohibition in the Netherlands. We suggest to organize your protests between 26 and 28 of November, because Eerste Kamer (First Chamber of dutch parliament) will vote about squatting prohibition beginnig of December. Friday the 13th sees Baths newest occupied social centre, The Black Cat open its doors for a free film nite. This Friday (13th), starting at around 7, the Black Cat social centre in Bath will open its doors for a free film and dinner night (suggested donations on the nosh). There are a wide range of films on offer, and we will collectively decide what to watch on the night. It is a massive space with loads of potential, and we are happy for people to crash after the film night. We also run regular self-defence workshops, a samba dancing class, a radical library, a freeshop and much more. During the night of november 1st to november 2nd, party of the dead, we did awake ! We’ve put a banner on the wall of an ex-squat, on Phalanstère street, in Grenoble city-center. This building is empty for years, its owner is Actis, who is “managing” business with “social housing” and so on (owning a lot of empty spaces). This building has been squatted in 2005-2006 (Parad is Yack) and in 2007 (La Poulie / Parad is Back). Everytime, it has been evicted by the Justice & Police crew… The second floor has been burnt a few weeks after the last eviction, to impeach the squatters to come back. The building is still empty.